Power Resource: 2*18650 Rechargeable battery (included), one can also work. Made of aluminum and imported brand new plastic material, anti-drop, anti-stab and durable for Outdoor Activities, such as running, hiking, hunting, fishing rain etc, and indoor working light. 1.The batteries need 12 hours to be fully charged. Avoid using your headlamp while charging. 2.Do not install upside down of the batteries positive and negative pole, if the batteries are installed in opposite position, it may damage the headlamp. LIGHT THE WAY - Never get left in the dark with the NYA Lights headlamp flashlight! This ultra-bright, 6000 lumens headlamp features 3 Cree LED bulbs to shine stronger, brighter, and longer than you ever thought possible. ALL-WEATHER READY, WATERPROOFED - You're prepared for anything, and your gear should be, too! NYA Lights head lamps are built to withstand all work and weather conditions, from extreme heat to bone-chilling cold. Plus, the air-tight rubber sealing protects the LED headlamp rechargeable battery from dust, ice, and water, for ultimate dependability. 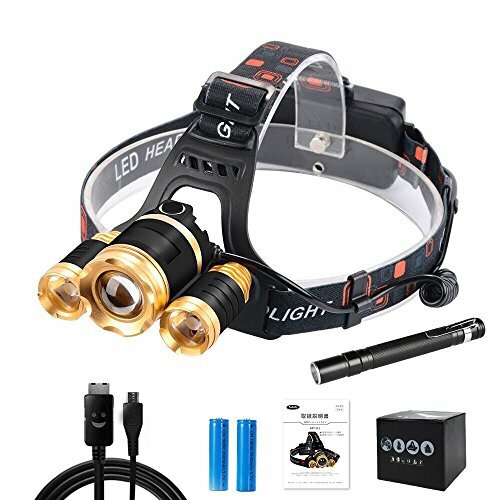 FIT FOR THE WHOLE FAMILY - with a little help from the adjustable headband, you should be able to tailor this rechargeable head lamp to pretty much any friend, neighbor, or family member who joins in your outdoor (and indoor!) adventures. COMBO PRODUCT - Whether you hike, camp, go fishing, or else, our headlamps and penlights provide you the light you need to stay bright. If you have any questions about this product by NYA Lights, contact us by completing and submitting the form below. If you are looking for a specif part number, please include it with your message.